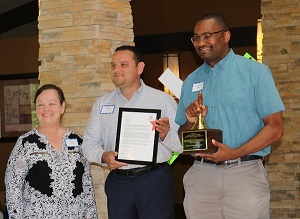 Mr. Donald Greene, manager at local Fallas store, receives National Operation School Bell® award. Also attending was Ralph Avila, District manger from Fallas. Mr Greene also received congratulatory letter from National President Susan Dolan. Mr. Greene received the award for his outstanding support for the Operation School Bell program. He is at every event and goes out of his way to supply needed uniforms and school clothes for our low income students in the High Desert.